Is Third Party Maintenance still valid for Oracle products or anyone else? Yes. Do you have to read every contract detail before a third party maintenance provider can host the software? Yes. If there are site restrictions and if you want to host it in a vendor’s own data center. Make sure you have the right to a site change or site license change. Can copies of software from customers that are loaded onto the server that are similar to what another customer’s rights be used be reloaded. Yes, the software license goes to intellectual property not to the media. Third party maintenance vendors can use the same instance in setting up their clients and this will drive down the cost. Does this ruling impact other businesses? Yes. If you have no site specific rights, you can’t have a third party outsource or host. This could have major legal ramifications for Oracle and other vendor’s existing hosting and outsourcing businesses. City of Flint – US District Court rules In Oracle’s favor. “Based on the court’s ruling s above, none of Rimini’s asserted license provisions (Sections 1.2(b), 1.2( c), or 14.2) expressly authorize Rimini ’s copying of Oracle’ s copy righted PeopleSoft branded software a s a matter of law. Therefore, the court finds that Oracle is entitled to summary judgment on Rimini’s express license affirmative defense as it relates to the City of Flint, and the court shall grant Oracle ’s motion accordingly“. Point of View (POV): The City of Flint’s PeopleSoft contracts were pre-Internet and did not allow for third parties to copy licenses onto other servers on their behalf. In fact, the licenses only allowed for the City of Flint to provide “access to and use of the Software” to a third party. The ruling makes sense and is based on how the license contract is written. Pittsburgh Public Schools – US District Court rules In Oracle’s favor. “Based on the rulings above, the court finds that none of Rimini’s asserted license provisions (Sections 1.1, 1.2, or 10.2) expressly authorize Rimini’s copying of Oracle’s copy righted PeopleSoft branded software as a matter of law. Therefore, the court finds that Oracle is entitled to summary judgment on Rimini’s express license affirmative defense as it relates to the Pittsburgh Public Schools, and the court shall grant Oracle’s motion accordingly”. (POV): Despite Oracle granting the Pittsburgh Public Schools “a nonexclusive, nontransferable license to make and run copies of the Software, “the right to access and use the Software is a separate right from the right to copy or reproduce software”. The ruling makes sense as with City of Flint based on the language in the original PeopleSoft contract. Giant Cement – US District Court Denies Oracle’s request for summary judgment. Based on this record, the court finds that there are disputed issues of material fact as to whether Rimini’s use of the development environment associated with Giant Cement was for archival purposes or whether Rimini accessed the software’s source code. Accordingly, the court shall deny Oracle’s motion for summary judgment on Rimini’s express license affirmative defense as it relates to Giant Cement”. 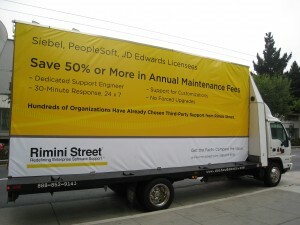 (POV): Rimini Street did show how the JD Edwards development environments were used only for archival purposes and not for software development and testing. According to the JD Edwards licensing agreement, the court ruling to deny request makes sense as the usage was in compliance with the licensing language . Novell – US District Court Denies Oracle’s request for summary judgment. “First, the court finds that the plain language of Section 2.1(iv) authorizes Novell to make archival, emergency backup, or disaster-recovery testing copies. Further, the court finds that the plain language of Section 2.1(viii) permits Novell to allow Rimini, or another third-party, to install the software for archival, emergency back-up, or disaster recovery purposes. Therefore the court finds that Novell’s license allows for archival and/or back-up copies of the software on a third-party system. Accordingly, the court shall deny Oracle’s motion for summary judgment on Rimini’s express license affirmative defense as it relates to Novell.”. (POV): The Novell specific Siebel contract language allows Novell to have any third party to make the back-up copies it needs. The court ruling makes sense. Rimini Street currently has 120 total contracts out of 700 clients in the data center. In conversations with Rimini Street CEO Seth Ravin mentioned that, “Rimini Street has been in the process of moving its customers out of their data center operations since 2012 “. The action to move away from a data center operation makes sense as half the 120 total contracts may have similar language while the other half have contracts with no site restrictions. In addition, Constellation has spoken to recent customers who are managed via remote access for JD Edwards, Oracle EBS, PeopleSoft, SAP, and Siebel. These clients have had little issues and have taken advantage of the benefits of third party maintenance. Constellation has put together an Enterprise Software Licensee Bill of Rights and An Enterprise Cloud Bill of Rights and checklist that clients can use to protect themselves. This is pertinent especially for cloud contracts which now resemble long term BPO deals and because the majority of enterprise software is now consumed via SaaS or cloud deployments. Despite a perception of simplicity in software acquisition, many cloud contracts require all the rigor and due diligence of contracts for on-premises licensed software. * R “Ray” Wang; Insider Associates, LLC; and Constellation Research, Inc.; provide software contract negotiations support and advice. We are not legal professionals or procurement professionals. Please check with your legal and procurement teams for the specific advice pertinent to your organization.